Vegan at L.A.B – Whatchya going to eat? – vegan in your city. 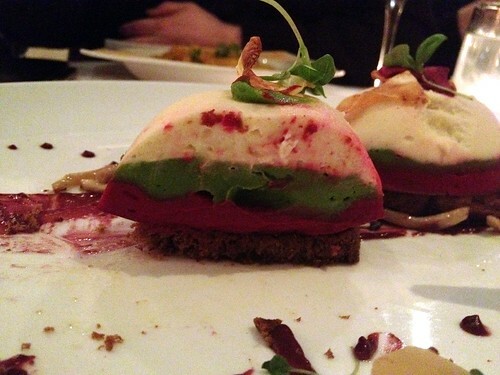 Home vegan food Molecular Gastronomy Vegan at L.A.B – Whatchya going to eat? There are a couple of vegetarian things on the menu, and at least one vegan thing. I sent a tweet the day before to @foodcult (the LAB account) asking if there was anything vegan, the response was that the terrine of harvest vegetables, and that the risotto could be veganized. Since I find it nearly impossible to get excited about risotto, the terrine was a predetermined inevitability as soon as I heard about it. I seriously appreciated the quick twitter response, especially since I sent it on a Saturday. The LAB website is also great in that it’s not annoying – no flash, no music starting up, no pdf files of the menus. Some other resto’s could learn a thing or too. Both groups of us ordered warm spiced olives and were informed that they just came with the meal – but they never showed up, and we forgot about them (until today when I was looking at the menu again thinking… wait… I want olives). But they did bring a basket of bread with garlic, rosemary, and olive oil, which is always a winner. 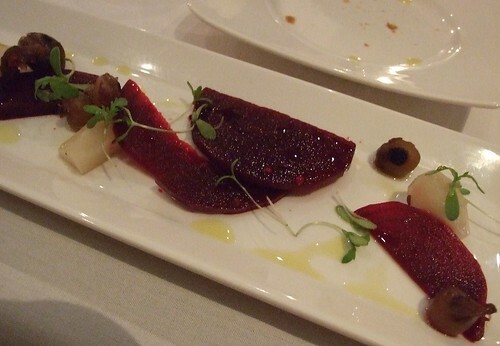 Other than no olives, service was excellent, friendly, and achieved that lovely balance of formal and casual. As an appetizer JC ordered the maple eggplant tapenade with crostini and chipolini onions, which looked kind of gross (sorry) – but was a fabulous combination of flavours. Moreover, the crostini acted as more than just a tapanade conveyance. Though not as tasty as my appetizer. House made pickled vegetables – beets, cipollini onions (or some equivalent tiny delicious onion, though I think I’m probably right) wisps of greens, and some other root vegetable that I enjoyed eating and identified at the time. I love beets. I love pickled onions. But I didn’t realized I liked pickled onions until last night. Not that I’m surprised. I am Polish after all. Pickled things are totally my scene. The terrine came on my plate like two round half spheres (I was going to allude to something else, but you can get there on your own if you want to). I also don’t understand what made it more of a terrine and not a mousseline – because the harvest vegetables (including another Polish favourite – celeriac) had a really mousse-like texture. I have no idea and it doesn’t really matter. 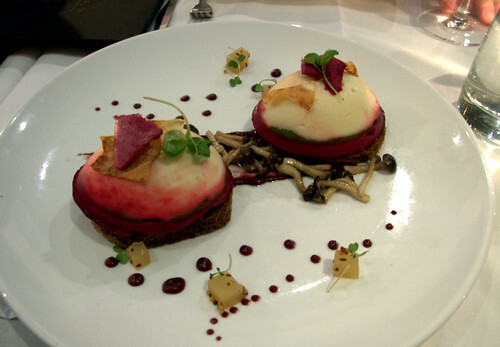 I especially liked the pickled apple and the middle line of mushrooms, and of course the reduced wine spots. Each layer of the terrine was slightly different in both texture and flavour, but I can’t remember the specifications although the server did tell me in detail while presenting the dish. 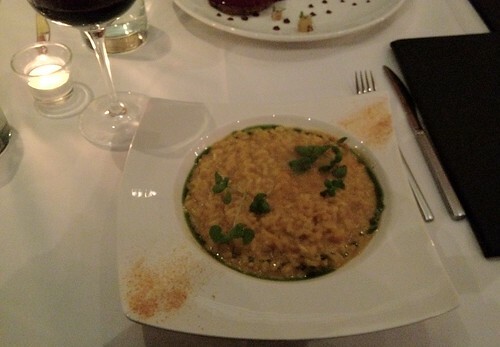 JC ordered the risotto, and I didn’t like it. It wasn’t pretty, I found it oddly sharp in flavour, but JC seemed to love it (which is what actually matters). I bet it would have been great with some kind of non-dairy replacement of the basil creme fraiche that originally comes with the not-vegan version of it. But I’m just biased in favour of anything involving basil. I might wait and see if L.A.B changes their menu again (hopefully with a more vegan positive outcome), but I would definitely go there again. It is somewhat expensive, but you can see the care and attention that goes into preparing each dish, and the quality of the ingredients – and for me that’s worth it. I am so curious to see what else Dubrovsky can come up with. 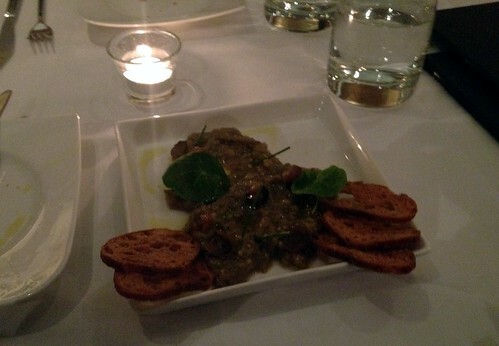 gastronomy, l.a.b restaurant, LAB, Live and Breathe, toronto, vegan food. Bookmark. I feel your pain but, having known sevarel top chefs, they will tell you that they are not willing to compromise quality. However, if they informed you prior to your dinner that they could meet your needs, then that is exactly what they should have done. This was another reason why I couldn’t maintain my vegan ways. I never want to be labeled the “impossible eater.” I have to attend too many business lunches and dinners. I just can’t make a scene everyday…unfortunately.